I’ve been trying to begin a new habit of pausing for a few moments of silence before starting my day. After only thirty seconds my heart already feels like a racehorse at the gate, keyed up and impatient. The only words that seem to come to my mind are the to-do list waiting for me. The only feeling I can summon up is anxiety. I thought, because I’m an introvert, this practice of a few moments of silence would be easy. But I’m finding this kind of time is more than an absence of noise, which I can handle and even welcome. Instead it’s an intentional choosing to be fully present to God. It’s about being quiet on the inside and this is much, much harder than turning down the volume on the television. It’s very loud in my mind, you see. There are worries and fears, insecurities and uncertainties. I can generally calm this crowd of hecklers by doing something. But sitting in silence only makes them shout. Yet as I stay on the edge of the bed it seems I begin to hear a deeper, clearer voice. 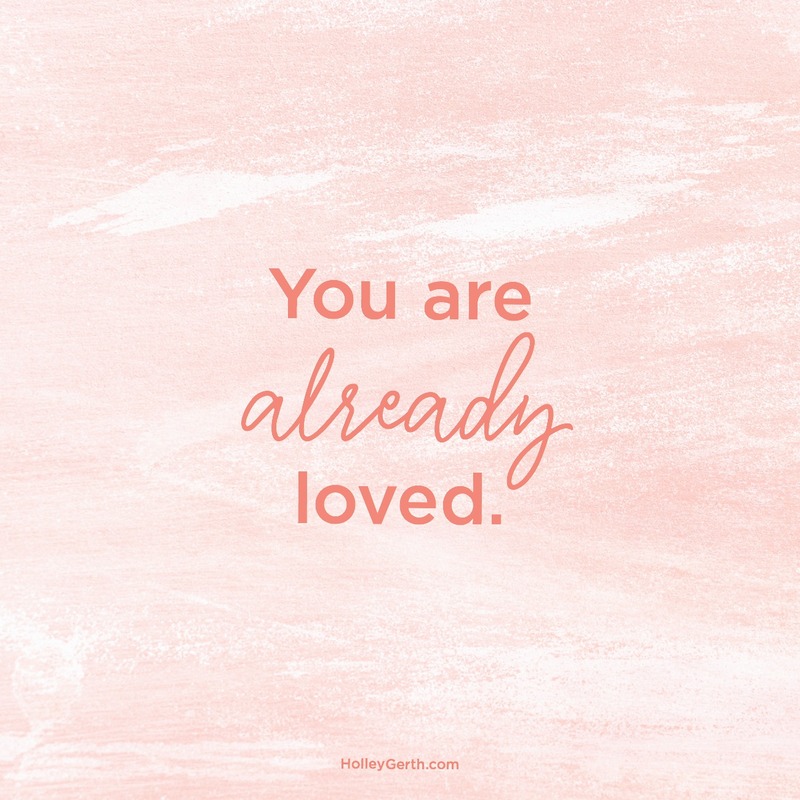 Finally, this single phrase comes to the forefront of my mind: You are already loved. Tears come to my mind because it is exactly what my soul needs to remember. Exactly. I sit still and repeat it over and over. I finish my few minutes of silence and take that phrase with me through the rest of the day. When something on my to-do list goes undone, when my plans turn to chaos, when I feel a bit weary I say it again: You are already loved. What does your heart need to hear today? Would you like to join me in starting a habit of a few minutes of silence? 1 – Choose a time and place. I picked sitting on the edge of my bed for about five minutes before I get up for the day. 2 – All kinds of thoughts will race through your mind. That’s okay and just part of the process. As each one comes, release it to God. Emily P. Freeman said, “When we sit in silence we may not be doing anything but we are undoing so much.” I have made a habit of hurry, of hustling for love and approval. I want to undo it. Maybe you would like to join me? We are invited into God’s arms today. We have worth beyond what we do. p.s. If you want more peace in your heart and day, you’ll find it in Hope Your Heart Needs. This new devotional came out of quiet moments I spent with Jesus. Writing it changed my life and I believe reading it will change yours. I’m so excited to share it with you! 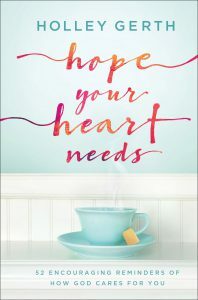 Hope Your Heart Needs officially releases September 18th but you can preorder it now. Here’s a free excerpt. I used to have a practice of sitting quietly for a few moments. But life happened, and it was forgotten. I’m glad you mentioned this, Holley. I think it’s time to pick up this practice again. Thanks for sharing it here! 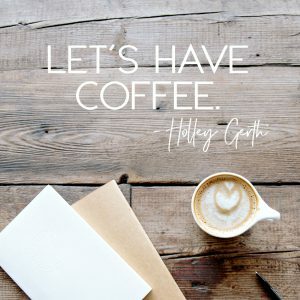 I write intimately about those early morning conversations with God in the first section of my 90 day devotional book, First Breath of Morning – Where God Waits For You Every Day, that comes out October 1st. Those early morning talks with God knit my heart to His for all that unfolds in the day ahead. Holley, what a wonderful post! I also take a few minutes each day in an attempt to sit quietly and listen to what God has to say. My mind is pretty noisy too. I haven’t heard anything earth-shattering yet, but the few minutes of peace each day is something that I have stopped dreading and started looking forward to. Being loved unconditionally is one of the most difficult things for me to understand and accept, yet is, thankfully, true! When the weather is nice, I enjoy sitting on my porch swing for a few minutes of quiet. Nature somehow stills my mind quicker than house silence. How refreshing to realize that we are already loved. Before we do anything. Just for being His. Such a great way to start the day, quieting the mind and listening for God’s truth! Thank you Holley for sharing this today. Blessings to you! Love the truth. It has taken a stick of God’s dynamite, but He is getting through the pain & hurt of abuse to those deep places within. I accept His love & am enjoying being loved. Willing to receive more of Him. I am not a to do list, but a daughter of the most High God!!!!! My mornings start on my sofa curled up in a blanket with a cup of coffee. I read several devotions and then have quiet time with the Lord. It’s the one time of the day that I can be totally alone with him. It is when he reminds me that I am loved, I am enough, and he will always be by my side. Thanks for your encouragement, you are a blessing. Awe yes, I remember the quiet moments. How refreshing to be reminded of the early morning times I spent talking to and listening to the Lord answer. What joy to know He is still there, even when I’m not! I’m a little introvert also. I feel the need to rush through my day getting lots of work done. No calm until all is done-this is especially true at work. Your idea of a quiet time is what all women need. Time to be still & let our noisy minds & to do lists rest. God said take time to be still & know that I am God. He knew this world would be noisy & hectic. He commands us to take time daily & be with Him. Starting your day with Him helps calm you mind, body & soul. Living down here we all need more calm in our lives. Oh, my. JUST THIS MORNING I journaled from an Andrew Murray quote about waiting in stillness before God! I wrote, “Lord teach me about being still. I am a Doer who is stymied by stillness! Help me learn how to truly rest in you, to let go of distracting thoughts, to simply enjoy your presence.” Now, here I am reading your post–the perfect lesson on ways I can rest, let go, enjoy my Heavenly Father’s presence, and receive a personal impression from him–every day. Thank you, dear Holley. I am going to make a copy of your three steps to stillness before God. So peaceful and soothing Holley. You just spoke to my soul. Thank you.